MANDURAH MINI BOBCAT SERVICES, BALDIVIS BOBCAT WITH DRIVER FREE QUOTES, ROCKINGHAM BOBCAT WITH DRIVER,ROCKINGHAM REMOVAL OF LAWN, BALDIVIS LANDSCAPING, SHED PADS, RETIC, MANDURAH BOBCAT WITH DRIVER FREE QUOTES, ROCKINGHAM SITE CLEANUPS. MANDURAH SITE CLEAN UPS WITH BOBCAT AND DRIVER. ROCKINGHAM RETICULATION & MINI BOBCAT, BALDIVIS BOBCAT & TIPPER HIRE, MANDURAH BOBCAT & TIPPER HIRE, KWINANA RETICULATION & BOBCAT WITH DRIVER. Rockingham Mini Bobcat, Bobcat and Driver Rockingham, Baldivis Golden Bay, Mandurah, Peel Region. Hire Brookfields fully insured Mini Bobcat, driver & 2.5 tonne tipper. Site Clean-ups, Grass removal, shed pads, mulching, fully insured, competitive rates. Hire a Mini Bobcat Rockingham, Mandurah. Reticulation Supply, Lay and Maintenance. All Reticulation Maintenance, Controllers Solonoids, servicing of systems. 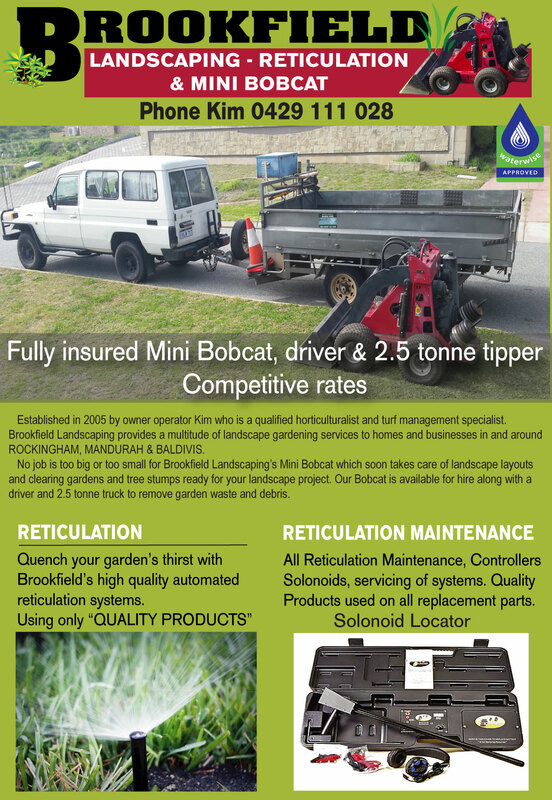 Brookfield Landscaping provides a fully insured Mini Bobcat & driver for hire service which is suitable for garden clean-ups, grass & tree stump removal and also for preparing the ground for sheds and workshops. We also have a 2.5 tonne tipper truck available for removing garden waste. Our Mini Bobcat has a width of only 1040mm and is able to easily access back yards and gardens where entry points are narrow.